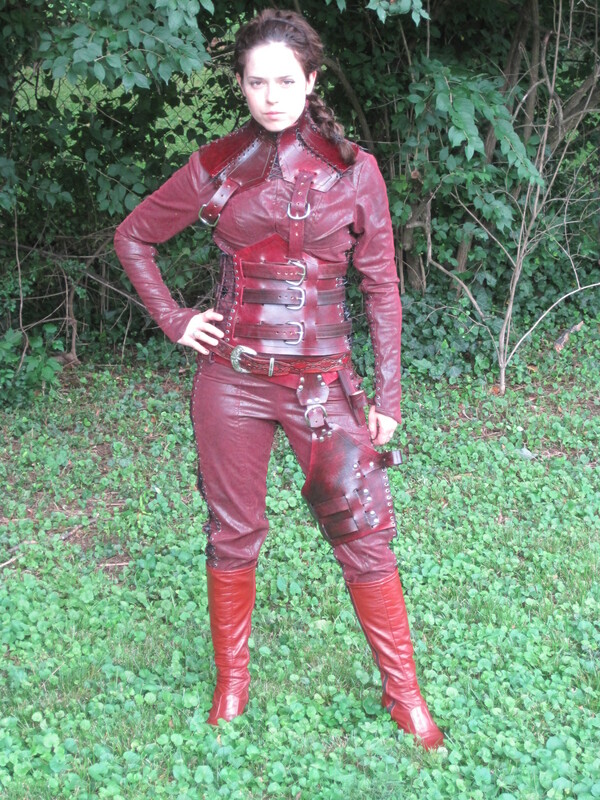 This Mord Sith costume was probably one of the hardest costumes I have ever made. I think it took me a good two or thee weeks to finish it. 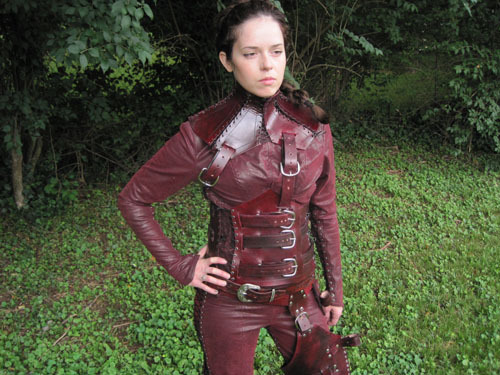 The pattern used for the Mord Sith bodysuit was one that I draped on to my body form. I could only drape the upper part of the bodysuit, and the lower part was drafted by the flat pattern method. I then blended the flat patterns together to make one complete bodysuit. The maroon bodysuit material was found at my local upholstery shop. Its a thin polyester vinyl that doesn’t have a lot of give. I realize now that not having a little stretch in this particular costume may have not been the best choice. I believe the real fabric from the show came from a leather company in Australia. 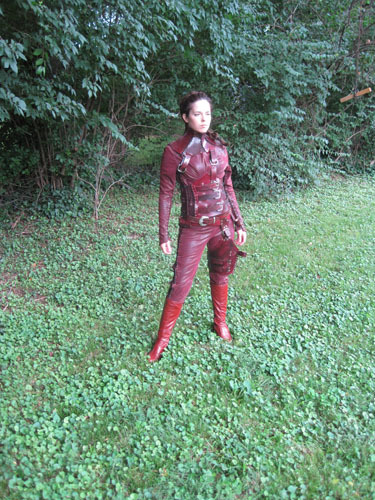 I was lucky enough at Dragon*Con 2010 to see and feel one of the actual Mord Sith costumes that Cara wore in the show! It was an extremely soft and thin leather that had a microfiber lycra backing. Its pretty hard to find a comparable vinyl, so I’m going to try my hardest to hunt down the actual fabric for the next Mord Sith I make. I think I must have used about a thousand eyelets to hold the bodysuit together. Other than the front zipper and front stitching down to the crotch, the entire costume is held together with lacing. I also learned that eyelets sometimes pinch, especially if there are a thousand of them spaced at about one inch apart on a very tight costume. With that being said, I highly recommend wearing a maroon colored lycra bodysuit underneath the costume. As for the lacing, I sent the costume out with thin vinyl lacing, and the wonderful customer Mandy, who ordered this costume, had replaced it with a small elastic lacing. This, I found, was a way better idea. Wow! The leather was the absolute hardest part of this costume. I felt like I worked my fingers to the bone trying to make this Mord Sith armor. I had to take several breaks while cutting the leather and punching the holes, due to the thickness of the leather. 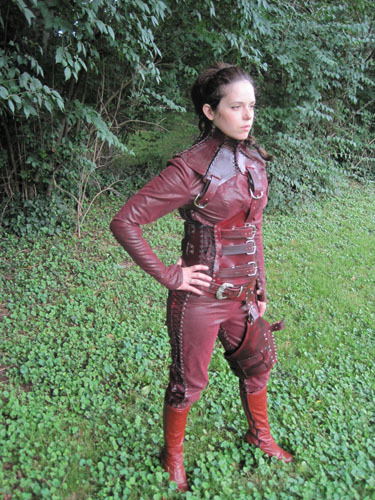 One of the things that I will definitely change about the next Mord Sith armor is using thinner/more pliable leather. It was pretty hard to even find good enough screen shots from Legend of the Seeker to see the different bodice, neck and leg armor pieces. I had to figure out the back of the bodice and leg armor for myself. The neck armor is composed of eight different pieces that were originally made from a felt pattern I draped on to my bodyform. I needed to make sure it would work in the leather, so I first took it off of the form and cut it out of thick vinyl and pieced it together. When that was okayed, I cut it out the leather. I tooled the leather to give it a finished look as well as smothed the outer edges. I then punched the holes out and dyed it a mixture of red and black to give it a nice maroon coloring. I then laced it up and put it back on the bodyform so it could start taking its shape to fit around the neck comfortably…well as comfortably as a Mord Sith costume could be. The bodice took a lot longer to make. I had to drape that pattern on the bodyform and guess a little as to what the back looked like. I then made that first pattern out of vinyl to check it and eventually cut it out of leather. This leather was a little thicker than the neck piece and was harder to cut and punch out holes. I had to cut out the slits in the bodice for the thick leather straps to loop in and out. After that, I dyed all of the pieces, attached the buckles, wove the straps in and out and hammered in the eyelets. I had to lace up the bodice and put it on my bodyform as well to start taking its shape. The leg armor was a little harder to drape because I had to drape it on the manniquin instead of the bodyform using tape. I tested it in vinyl and then cut out the leather. The leg armor was tricky because I also had to attach the bottom part of the agiel holster. 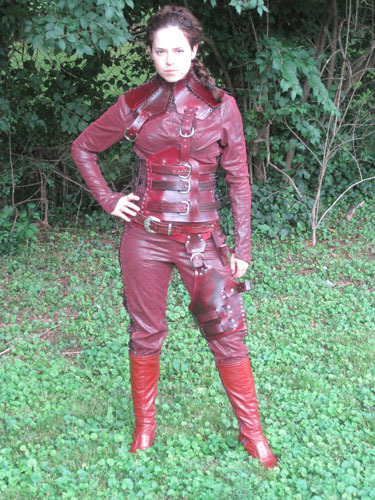 When I finished the leg armor, the only thing left to do was attach the different buckles to make all of the Mord Sith leather armor fit together. The belt was the final piece of the Mord Sith armor to make with the top part of the agiel holster attached. I found the belt at the goodwill in the men’s section. I then sanded it down and redyed it to match the other armor. I also purchased a new belt buckle that looks more like a Mord Sith belt. The only thing I am missing is the actual agiel. Our customer Mandy was making that on her own. Other ideas for going all out on the leather is to buy the floral machine stamped leather at you local leather shop, or trying to hand-tool the leather yourself. This, though it would be cool and more authentic looking, would be either very expensive or very time-consuming. I really hope you enjoyed reading this tutorial as much as I enjoyed writing it! If you have any further questions or comments, please feel free to email us at our contact page! Your Mord’sith costume looks great! I am in the process of replicating the Denna white, so I definitely feel your pain when it comes to leather work. I read in your blog that you had trouble coming up with pics for the back. Definitely check out Mord’sith leathers group on facebook. The moderator has a ton of detailed pics of her costume…I would be lost without them! Also, there are a ton of discussions about leather, buckles and such! Your costume does look super fantastic!